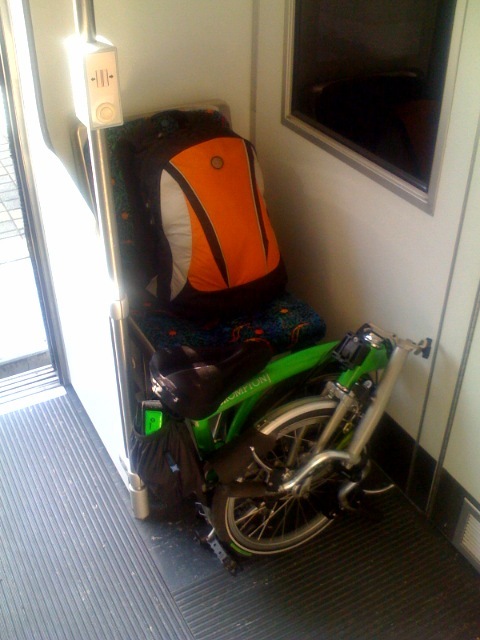 A folding bike on the Gold Line. The Los Angeles County Metropolitan Transportation Authority (Metro), in partnership with CALSTART, a non-profit advanced transportation consortium, will be conducting a survey to determine public interest in folding bicycle use with transit at five Metro stations throughout L.A. County July 20 through 28. The surveys are designed to gauge public interest in bikes that, when folded, take up less space and can be more easily transported aboard Metro trains and buses. Metro’s current bicycle rules allow folding-bikes inside transit vehicles at all times when they are folded. The findings will help Metro develop a Folding Bicycle Implementation Plan to seek funds for a countywide program that could allow transit riders who buy a transit pass the opportunity to receive an incentive such as a voucher, rebate or discount toward the purchase of a folding bicycle for use on Metro trains and buses. Surveys will help determine interest, participation and encouragement strategies for such a program. Like other transit properties nationwide, Metro seeks new and innovative ways to better accommodate an increasing number of bicycle riders on its system while ensuring sufficient capacity for all its bus and rail passengers, especially during daily peak commuting periods. Metro is committed to supporting bicycling as a smart, clean, and healthy transportation choice. When combined with transit, bicycles are an effective solution to and from a transit station especially if the distance is too far to walk or too close to drive. The survey is being conducted by Metro and CALSTART, a non-profit advanced transportation consortium dedicated to the growth of a clean transportation technologies industry that will clean the air, secure the nation’s transportation energy future, create high-quality economic opportunities, and reduce greenhouse gas emissions. This project was funded by Caltrans through a Community-Based Transportation Planning Grant. Next steps include incorporating the survey feedback into the plan, which is scheduled to be completed by September 2010. The plan will assist with applying for grant funding to launch the program. Those interested in participating in the folding bike survey can do so online at http://surveymonkey.com/s/foldingbike. For more information on Metro’s Bicycle Program, visit www.metro.net/bikes. For more information on CALSTART, visit www.calstart.org.